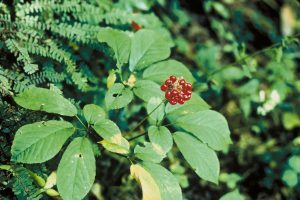 The cultivation of ginseng, a medicinal plant native to Appalachia, could provide a boost for local economies. Most people who live in or come to visit the mountains know that just being here, surrounded by lush green hills and clear, fast-flowing rivers, can have a healing effect on the soul. But not as many people know that many of the plants that make the mountains’ forest floor so lush and green have real medicinal properties and, when used properly, can help treat ailments ranging from sore throats to cancer. Growing and marketing those wild medicinal plants and herbs was the subject of a recent workshop offered by the group Appalachian Communities Encouraging Economic Diversification (AppalCEED) in Norton, Va. Based in the heart of Virginia’s coal country, AppalCEED works to promote sustainable ways to diversify the local economy. The workshop focused on helping local landowners, farmers and gardeners gain the information they need to break into this innovative and sustainable market. Turnout to the workshop was a testament to the possibilities and enthusiasm for new ideas to boost local economies. The room was overflowing with interested people who came from as far away as Williamson, W.Va. — an hour-and-a-half drive. Part of the draw was the expert panel that AppalCEED assembled for the workshop, which included three experts on the cultivation of wild and medicinal plants and herbs. Scott Persons, Jeanine Davis and David Grimsley are each highly regarded as “gurus” in their niche field of study, and each gave detailed presentations on their respective areas of expertise. Persons and Davis have co-authored a book together that is held as The authoritative text on growing and marketing the plants. Another big draw is the fact that wild ginseng, perhaps the best known of Appalachian wild medicinal plants, fetches anywhere from $700 to $1,200 per dried pound. While it’s possible to cultivate ginseng on a commercial scale in large fields, the resulting crop is deemed to be of lower quality than its wild-grown counterparts. Persons has spent his career developing a technique known as “wild simulated” cultivation, where ginseng plants are deliberately planted in small patches in woodlands. This allows for resources and energy to be concentrated, streamlining the process. He’s also developed techniques that can produce a product identical to that of ginseng that would pop up naturally in the wild. While Scott’s presentation was exclusively on ginseng, Davis and Grimsley focused their talks on other plants, such as goldenseal, black cohosh and even some medicinal plants native to China. All three presenters stress how cultivating these plants in our woodlots and gardens can help to preserve threatened wild stock from being over harvested. They also discussed strategies for cultivators to supplement their income through strategic marketing. Grimsley in particular is working to develop co-op-like arrangements among consortiums of growers in Floyd County, Va., to reduce production costs and increase collective selling power. At the end of the day, we’re still talking about farming, even if it’s on a small scale. And while farming these plants won’t make anyone a millionaire overnight, the extra income can certainly help. Anything helps these days. The coal bust has created some harsh economic realities here in Central Appalachia. The implications of our reliance on one major industry for a century are finally becoming unmistakably clear. No one industry or sector can or should replace coal as it fades into history. We could do well to take a lesson from Appalachia’s forests: there’s strength and healing in diversity.